A boy wakes up on a mysterious island. He can't remember his name or how he got there. Is it a nightmare? Did he ever have a home and family? And worse, can he ward off the hairy wolf-like beast and find his way off the island? The Boy, the Boat, and the Beast will cause the reader to wonder all sorts of things: like, who is the narrator? (hint: it's not the boy) and how did the nameless boy get on the eerie island? I was eager to read to the end in order to find out, and Clark answered all this reader's questions in a satisfying way. 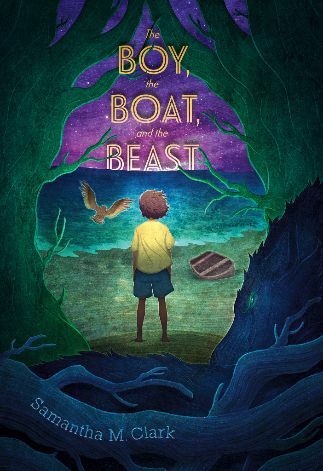 The Boy, the Boat, and the Beast is a story about facing one's fears and finding the truth, no matter how scary it is. A boy washes up on a mysterious, seemingly uninhabited beach. Who is he? How did he get there? The boy can’t remember. When he sees a light shining over the foreboding wall of trees that surrounds the shore, he decides to follow it, in the hopes that it will lead him to answers. The boy’s journey is a struggle for survival and a search for the truth—a terrifying truth that once uncovered, will force him to face his greatest fear of all if he is to go home. Note: The reviewer was given an advanced copy of the book in exchange for an honest review.